The Mobile Info Team aspires to support individuals caught in an inefficient and complex European asylum system. We aim to improve the situation of refugees by providing them with vital information, clarification and assistance for the full duration of their asylum procedure. We fight for their rights and dignity in refuge, and try to find solutions to the issues they face along the way. The Mobile Info Team offers personal assistance with individual asylum and family reunification applications. So far we have provided guidance to hundreds of individuals and families applying for asylum and family reunification. This has directly resulted in countless positive decisions for asylum and reunification applications. Our Volunteers are law students or lawyers who often already have experience in the field of asylum and migration law and who receive intensive training on the details of the Greek asylum system upon arrival. It is also very important for us to conduct our contact with our cases in a manner that takes into account variations in culture and practices, in order to avoid misunderstandings and respect the diverse nature of people we talk to . Our translators also work as cultural mediators. Some of them have gone through asylum procedures themselves. 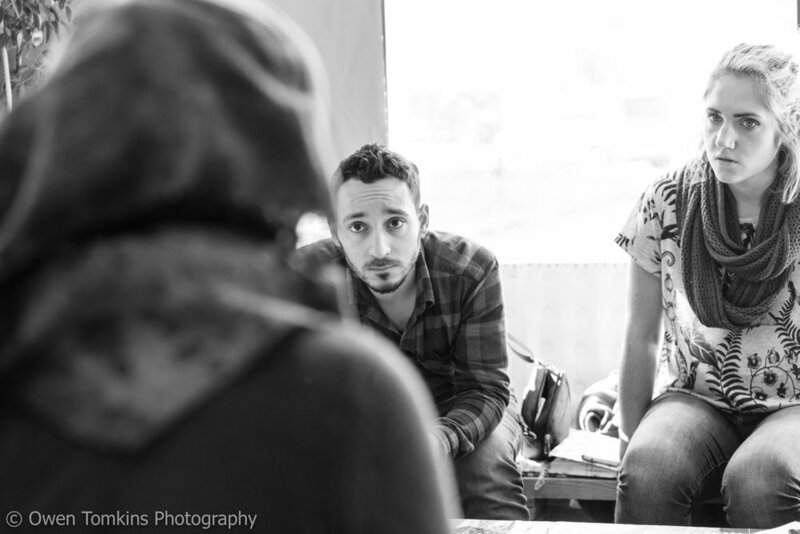 They have been the driving force behind the close relationships the Mobile Info Team has developed with asylum seeker communities in Greece. Through providing accurate, up-to-date information on asylum procedures in Arabic, Farsi, English, and lesser covered languages such as Urdu and Bengali, our Facebook page aims to give asylum seekers an understanding of asylum procedures and their rights in a way that avoids condescension and mistrust. Our information is fact-checked and verified – we take every possible precaution to ensure it is accurate. We have so far more than 25,000 followers on our page, and our posts usually reach between 10,000 and 30,000 people. We also respond to comments on our posts and answer questions received via our inbox. The Mobile Info Team offers Info Sessions in a group setting to enhance knowledge on asylum procedures including Family Reunification and asylum in Greece, but also topics regarding travel documents or how to get a work permit. Info Sessions are a great way to give people a general overview of options and pathways to asylum. Once general information is provided our team connects with individuals to understand their personal circumstances and options. If a person needs additional support we refer them for further guidance with one of our volunteer caseworkers. Primarily these sessions are targeted at the asylum seeker population throughout Northern Greece, but we have also offered sessions to other grass root organisations and volunteers working with the community of asylum seekers and migrants. For more information on our Info Sessions please contact us via email. In 2016 we started a petition to demand a more effective way to apply for asylum for the thousands of stranded people in Greece than the inefficient Skype-system. We received more than 200,000 signatures. In March 2017, the German Interior Ministry drastically limited family reunification transfers from Greece to Germany. If this would have continued, even people who’ve had their transfer approved would have had to wait 3 additional years to be with their families. We gave affected asylum seekers a voice by helping them to write letters to the German Interior Ministry. We raised awareness about this topic by starting a petition that was signed by nearly 30,000 people. Additionally, we co-ordinated the contact between specialised family reunification lawyers and affected asylum seekers here, to give them the possibility of reclaiming their rights in front of a German court. The cap for transfers has in the meantime been lifted, but waiting times to be transferred are still double the time which has been set out by law! In autumn 2017 we launched a video about the struggles of Pakistani asylum seekers in Greece to gain access to the asylum system. Monday to Friday from 10.30 a.m. to 12.30 p.m our phone line is open for asylum seekers to ask questions. During those hours, we also provide answers to questions received through WhatsApp recorded messages. Calls can be received in Arabic and English. WhatsApp messages we can answer in Arabic, Farsi, Urdu and English.